For some reason this weekend was tough for me. Maybe it was because my Dad has been at my house for a month while I was at his house for month, and he came home Saturday. Maybe, because it was rainy and all my plans got ruined. Maybe, because it will be a month since Toby passed away. Maybe because I waitressed Friday night – something I haven’t done in at least 12 years. Maybe, because Maddux just seems super lost to me, and when I look at him, I can’t help but think he lost his best friend and doesn’t understand why. Maybe, because everything Bear (and I) does is criticized constantly. In three days, not one positive thing was said to me or him. Whatever the case, minus the concert I went to on Saturday night, it was a tough weekend for me. Monday, which I had off because of Columbus Day was especially difficult. I woke up in the middle of the night and couldn’t get back to sleep, which set the stage for a crappy day. I was laying in bed with Bear and Maddux on Monday afternoon feeling terrible, and I finally picked up a book I started to read a few weeks ago, but started crying so much that I put it down – “Heart Dog: Surviving the loss of your canine soul mate”. 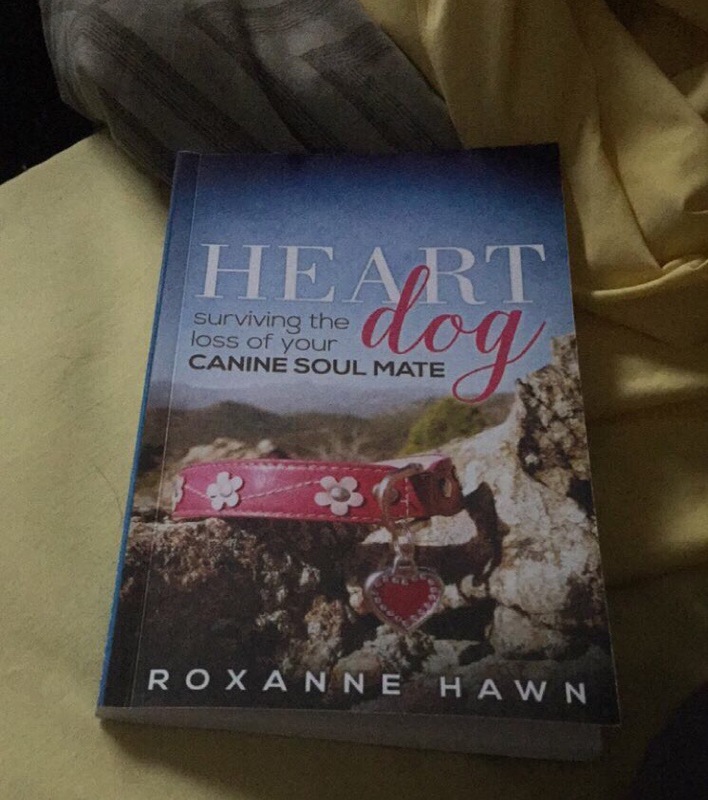 Written by Roxanne Hawn, the author of the blog, Champion of My Heart, the book uses the experience of her heart dog loss, along with research she conducted, as a guide to dealing with this type of loss. Roxanne, who always left encouraging comments on my blog and Facebook posts when I would write about dealing with Toby’s illness, offered to send me a copy of the book right after Toby passed away. I took her up on the sweet gesture. Honestly, it took me two days to open the package when it arrived. It sort of made Toby’s passing even more real. Once I did open it, I got a few chapters in, and started to cry. I put the book down next to my bed and it just sat there – for almost a month, until yesterday, when I decided to pick it up again. Still with tears in my eyes as I read it, I related to so many of the things she wrote. And, it made me feel like I wasn’t crazy with some of the things I did and have felt. Because of the way things happened, I didn’t get Toby’s collar back until I got his ashes back, which I picked up on my lunch break at work. I kept it together all day, but when I got home, I took his collar, wrapped it around my fingers and hand, held it incredibly tight, lied down on the couch and cried – for hours. Part of what I wrote last week about replaying the whole thing in my head and second guessing Toby’s treatment, also normal. In fact, many of the things Hawn wrote about I have been doing and feeling, and you know what, they are all normal. And, what I mean by normal is, normal for me. If I got one thing out of the book (which I definitely got more than one thing out of it) but it was the message that we all process grief in different ways, and that although society wants us to be immediately okay, that’s not always the case, and that is okay. There was a paragraph in the book that talked about the first week after you’ve lost your heart dog and it says, “don’t expect to be fully functional, but try to function a little.” I laughed, because I had to be fully functional the next day. I had a team meeting that was attended by our group publisher and editorial director, and I had to be fully present with ideas. I had a fundraising event I was planning, I had guests coming to my house that weekend, I had the biggest deadline of the year that week. I guess what I’m trying to say is that the book really helped me realized what I felt and have been feeling at times, is okay. Not everyone will understand what you’re going through, and that’s okay, too. We all process our grief on a different type of timeline and as long as we are not doing any type of self-harm or harm to others, it really is okay. Thank you, Roxanne for writing this book. You are welcome. I’m glad you found a few messages of comfort inside the book.